When you’re feeling stressed, these powerful stones will remind you of what makes you strong. 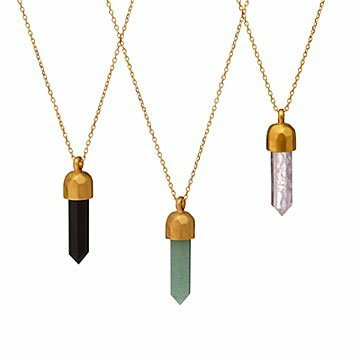 Calling all independent ladies: Satya Scainetti's powerful crystals have your back. Choose the stone that speaks to you, whether that's onyx (representing perseverance), rose quartz (a classic symbol of love), or aventurine (a pretty green number that stands for balance). When you're feeling stressed, wear it as a reminder of what makes you strong. It's a little like a pick-me-up strung on a gold-plated brass chain. Handmade in Thailand. 1.1" x 1/4" Dia Chain: 18"